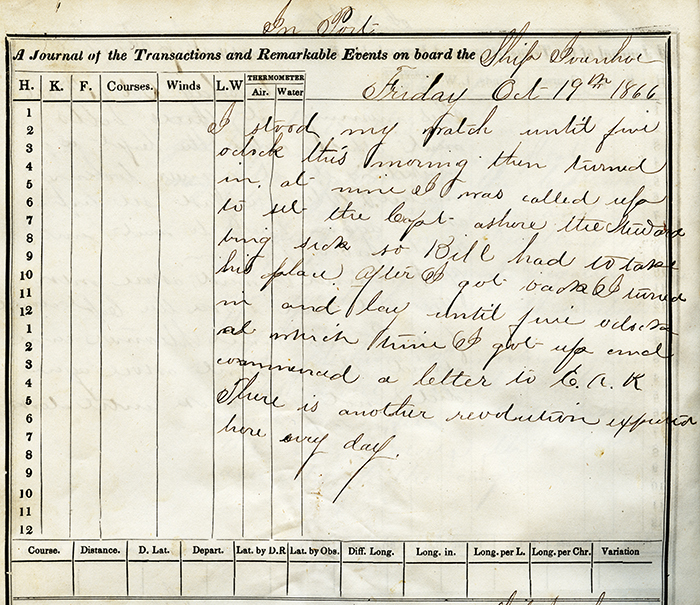 Oct. 18: "Went ashore three times this morning, three times before breakfast and twice after, twice to the lumberyard. I rec'd a letter from E.A.R. This afternoon I relieved Bill of the watch, us boys take a week about a standing it. I have had a week of pulling and now I will try watching, neither of them are very pleasant." The person aboard ship in charge of provisions and aiding the cook. was being sick, so Bill had to take his place. After I got back I turned in and lay until five o'clock, at which time I got up and commenced a letter to E.A.R. There is another revolution expected here any day." Oct. 20: This morning they hauled the ship to the upper end of the bay, as the rest of the lumber is going to another yard." Oct. 21: "I woke up at breakfast time and could not get asleep again so I finished my letter to E.A.R. and wrote one home. The mail leaves for Panama tomorrow, Bill and his second mate have been ashore on liberty." Oct. 22: "I saw the Andes Mountains, all were quite plain, they look barren enough. They make me wash up our floor mornings before turn in, never mind only three nights more." Oct. 23: "After dinner I went in a swimming then I set the steward ashore. Turned in at half-past two and slept until six." A looped rope, strap, hook and eye, or grommet used as a handle or as an oarlock.."
A mechanically-propelled vessel in which the principal motive power is steam, as opposed to a sailing vessel or motorship. Steamboats traditionally were the sometimes sizable coastal steamers, while steamship referred to ocean going vessels. ."